Thanks to television dramas and criminal trial news coverage criminal law procedure is familiar to many. How a civil lawsuit proceeds is less well known. Here we are going to learn more about the process and purpose of civil and criminal law differ. In a criminal case, the government seeks to impose penalties upon an individual for violating the law. Those penalties can include fines, loss of freedom or even death. The purpose of the penalties varies from revenge, deterrence, rehabilitation or incapacitation to protect the community. A civil lawsuit differs in that it is to resolve matters between private parties. One person believes another has harmed him, and the courts are available to resolve the problem. In a civil lawsuit, an individual or corporation called the plaintiff brings another party, referred to as the defendant, to court. The plaintiff asks a judge to order the defendant either to pay money or perform a specific action. A civil suit may involve family law matters, a contract dispute or a tort. A tort is a wrongful act, not including a breach of contract or trust, that results in injury to another’s person, property, or reputation and for which the injured party is entitled to compensation. Intentional torts include battery, libel and slander. Negligent torts are the result of conduct that causes unintended injury. Auto accidents, medical malpractice or product liability are examples of negligent torts. An attorney well versed in a particular legal area is important as each has rules unique to it, though the basic principles that follow apply in most instances. The plaintiff, or injured party, typically with the help of an attorney, files an initial document called a complaint, the first pleading in a civil action, stating the cause of action. The plaintiff’s complaint asks for damages or relief from a defendant, who is alleged to have caused the injury. The complaint outlines the legal and factual reasons why the plaintiff believes the defendant is responsible for his injury. The clerk of the court then issues a summons to the defendant. Either the sheriff or a licensed process server formally delivers the summons to the defendant. The summons provides notice of the lawsuit and a copy of the complaint. The defendant or his lawyer has a specified time to either personally appear in court. The defendant is required to file a document referred to as an “answer”. The answer addresses the facts and the legal claims in the complaint. The answer tells the court which facts in the complaint the defendant agrees with, and those with which he disagrees. Once the complaint and answer have been filed with the court, attorneys for both sides consider proper motions. A motion is a request to the court to issue an order. The defense may file a motion to dismiss, indicating the complaint does not contain facts making the defendant liable to the plaintiff. A defendant may file a motion to dismiss before his answer. The plaintiff may file a motion for summary judgment, which says the parties do not disagree about the facts of the case and that those facts make the defendant liable to the plaintiff. If a court grants either of these early motions, the lawsuit may end. This is why motions to dismiss or for summary judgment are usually the first parts of a lawsuit. If these motions are denied (or not filed as inappropriate), then the lawsuit proceeds. The next part of the process is discovery. During discovery, the parties exchange information and documents related to the claim in the complaint and defenses asserted in the answer. During discovery, depositions may be conducted. A deposition is testimony given under oath by people with information related to the lawsuit recorded by a court reporter. As discovery proceeds, the parties have pre-trial conferences with the judge. The parties advise the judge of discovery progress and in some situations discuss possible settlements. The judge often aids in negotiations and sets schedules for completion of discovery. During the pre-trial phase, the lawyers may request the judge to bar specific evidence, witnesses or arguments as legally improper. The judge grants or denies the motions. Upon completion of discovery, decisions on pre-trial motions and failure to reach a settlement the matter is ready to go to trial. At the trial, the plaintiff presents evidence first to a judge either in a bench trial or a group of citizens in a jury. After the plaintiff presents evidence, the defendant has an opportunity to present the defense side of the case. The plaintiff has the burden of proving his case by a preponderance of the evidence. This means that it is more likely than not, that the claims of the plaintiff are true. This standard of evidence is much lower than the criminal standard of beyond a reasonable doubt. Both sides present their cases, and then the judge or jury decides. If the judge or jury finds against the plaintiff, the case is over. The judge enters a judgment in favor of the defendant releasing the defendant from liability for the plaintiff’s claims. If the judge or jury finds for the plaintiff, the defendant is found to be liable and judgment is entered for the plaintiff. The court then awards damages (money) and/or orders the defendant perform a specific act. This order concludes the trial process and is a judgment in favor of the plaintiff. The losing party may file an appeal if they believe the outcome was incorrect legally. An appellate court may dismiss the appeal, hear and affirm the judgment, reverse it, or send it back to the trial court with instructions to correct legal errors. Many lawsuits go between the appellate court and trial court multiple times before final resolution. When a judgment becomes final in favor of the defendant, the plaintiff may not file suit on the same basis in the future. If the ruling favors the plaintiff, the defendant must observe all the terms of the judgment. Failure of the defendant to obey the judgment places the defendant in contempt of court and brings the danger of prosecution and other penalties for that contempt. Additionally, a plaintiff with a judgment may seek to enforce it by obtaining a court order to seize the property of the defendant to satisfy the defendant’s debt. A final judgement against a defendant can be collected even if the defendant has moved to another state. This is due to the Constitution’s “Full Faith and Credit Clause”. 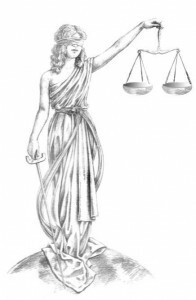 The above outlines the basics of how a civil lawsuit proceeds. There can be many twists and turns along the way, with the attorneys filing many different motions. There are time deadlines and extensions. The process is extremely important. A plaintiff or defendant can be completely right on the facts but fail to follow the process and lose the case. While a party to a lawsuit should have an understanding of the basic process, each area of law has its own quirks. The rules for a breach of contract, intentional torts, negligent torts, family law, or malpractice differ from each other. An attorney should be familiar with not only the general process, but also the specific area of law.